G750 is even slimmer and more gamer-centric than previous G Series notebooks, which is saying a lot. It meets your gaming needs as the ultimate weapon in any gameplay genre, making you a better gamer and a mightier ally to your teammates.Once more, the eye-catching design draws inspiration from stealth fighters, presenting an ergonomically-inclined surface for greater comfort during long gaming sessions. The screen offers wide viewing angles and supports NVIDIA® 3D Vision™ technology for action in the third dimension. To better keep in touch with your co-op partners and everyone else, there's an HD camera, while a range of exclusive accessories complete your gaming experiences for more thrills at home and away. With G750 no corners are cut as we make sure it augments your experiences. Its premium gaming keyboard arrives with sensitive response and durable keys that can take the pressure. Typing and controlling games is easy and comfortable, and the keyboard is stylishly backlit to look great and remain fully usable even in the dark. It's also a seamless keyboard built using one-piece construction for better strength, and offers highly tactile scissor-feet touchpad buttons to offer improved response and longevity. G750 sets its sights on all-new benchmarks of powerful performance that is always available to you. Games run faster, your experiences are augmented by lightning-quick response, and complete stability is guaranteed with superior cooling that uses a unique rear-venting design to push heat and noise away from you. If you game, play to win, which is why G750 is armed to the teeth with new technology, from the 4th gen Intel® Core™ i7 processor and NVIDIA® GeForce® GTX 780M GPU to the latest in connectivity and data transfer. It drives games in ultra detail and complete fluidity, while eliminating bothersome delays. Where many gaming notebooks treat sound as an afterthought, G750 puts it front and center. 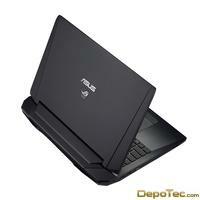 It features exclusive ASUS SonicMaster and ROG AudioWizard, designed by a dedicated team of audio engineers as a careful balance of hardware and software towards the best notebook sound. Sure, with G750 your games look their best, but they also sound fantastic. Every effect and note comes out with increased power, range, and clarity. This is more than enjoyment: as any gamer knows, sound is critical to success play, giving you the edge with sonic awareness and positioning. G750 integrates the latest design, with features specifically created for gaming and gamers. ASUS cloud services provide the most complete platform for online living that's accessible anywhere from a host of devices. With ASUS WebStorage, convenience is the main priority, offering you easy storage, sharing, and syncing of everything from business presentations to photo albums and favorite multimedia content. Each ASUS ROG G750 comes with 32GB of WebStorage space free for the three years, and offers you the MyBitCast app so you can easily sync your content to multiple devices and accounts simultaneously.